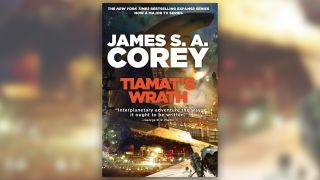 That's a joke that "The Expanse" series authors said they tell often, and it's a guiding theme in "Tiamat's Wrath" (Orbit, 2019) out today (March 26). This entry deftly sets the stage as the penultimate installment in the authors' nine-book series. Daniel Abraham and Ty Franck — who together pilot the pseudonym James S.A. Corey — chatted with Space.com about the new work and what lies in store for the crew of the Rocinante. In this installment of the series, human politics and manipulations run up against powers much more far reaching. And the alien infrastructure that characters have encountered, including in the series' novellas, starts coming to life — metaphorically, of course. "There's some stuff we've sort of been hinting at for a while that we've kept off the main screen that this book really shows in close up," Franck told Space.com. "That'll be fun. This is our book about the hubris of humanity against the implacable preternatural foes." "And it's a switch from the human political struggle that we really focused in on," Abraham said. "As we go on, we get farther and farther away from late Apollo 13 and closer and closer to early Buck Rogers. That's always been the intent of the project, to bridge that whole span of the genre. There are elements in this that get weirder and cooler and start kicking in and paying off some of the promises we made early on." One pleasure of following a series spanning this much time — the previous novel, "Persepolis Rising" (Orbit, 2018) began with a 30-year time skip — is watching familiar characters slot into new roles as the environments around them change. This means that some characters, unfortunately, are no longer in play, but others get new chances to shine. James Holden stays out of the spotlight for much of this book after serving as a primary viewpoint in all of the previous ones, and his sidelong perspective of events shows a different facet of his character. The rest of the crew find themselves in very new environments, falling into unexpected roles that end up feeling inevitable. "I think we get to play aspects of the characters that we've earned, because we set them up, but we haven't seen before," Abraham said. Through this book's viewpoint characters, readers get a closer look at how a human society rises to power by taking advantage of alien technology; the bad decisions that large groups of humans make are particularly believable in this book, if sad. "One of the things we hear sometimes is that 'Oh, our villains are so villainous and straightforward and one-note,' and then we look at, like, people and headlines, and — yeah, i'm not feeling we're doing more mustache-twirling than people who are actually in the news," Abraham said. "And people are really good at talking themselves into plans. We are excellent as a species at coming up with an idea, and then, because we came up with it, we think it's good. It happens over and over and over." The book is fast-paced and has big, cinematic moments — though Franck emphasized that the authors definitely don't write with the screen in mind — while clearly building up to an even bigger finale. "A lot of things that we've been laying in for several books are starting to come to a head and converge and aim toward that last moment that's still coming," Abraham said. What that moment will be, and what could possibly tie up all these threads, will surely be fodder for avid speculation after this books' release. Good thing the writers seem to put out books at an impressive rate of close to one per year. Oh, and by the way — that final book will be the end of 'The Expanse,' and the end of the story arc set forth in the first book. But it's "unlikely to be the end of James S.A. Corey," the two authors said.